It's time for the New Product Launch! All the Stamps, Die-namics, and Stencils can be found HERE. Please remember to visit each of the MFT Designers' October New Product Launch posts on the MFT Blog and leave a comment by the end of the day on Thursday, October 5 for your chance to WIN one of two, $100 Gift Vouchers. Ready? Set. Comment! I have two sets of lip balm treats to share with you today. Both sets of tags feature the Lip Balm Pouches, Lip Balm Window & Frame Die-namics, and Tall Tag Duo Die-namics. My first duo of treats is perfect for Halloween treat bags. I coloured a few small images from the Fab-BOO-lous Friends stamp set and I paired them with some patterned paper in black, orange, and green. 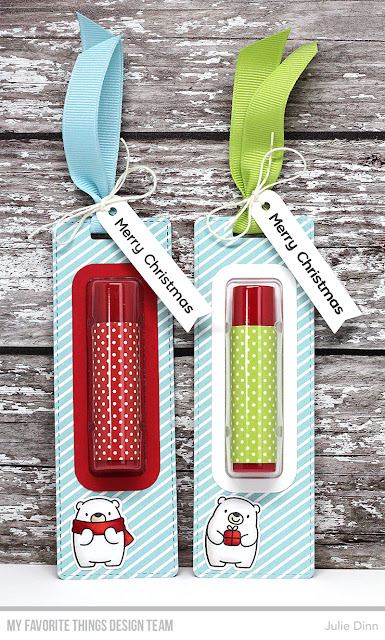 For my second set of lip balm tags, I went for a Christmas theme. I stamped a couple of bears from the Bitty Bears stamp set and coloured them with Copics. The sentiment is from the Snow Globe Sentiments stamp set, I stamped it on a tag form the Tag Builder Blueprints 6 Die-namics. Both sets of lip balm tags were finished off with a bright piece of ribbon and a twine bow. Gosh I love those lib balm tags... I have some young ladies in my life who would love that! Perfect for little trick or treaters! Fun tags! Love that you created both Christmas and Halloween ones! Fun idea for both Holidays--the colors are perfect. Those balm gift tags are awesome! Yours are colored super cute! I just love this idea! Sweet and fun! How cute! Love the colors and the little creatures! 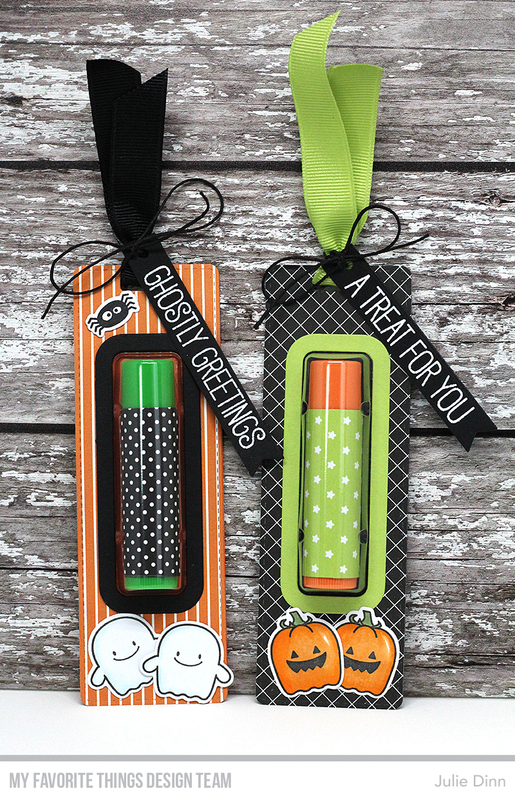 Love how you decorated these lip balm tags!! What a darling set of Halloween treats and Christmas stocking stuffers! Beautiful projects! 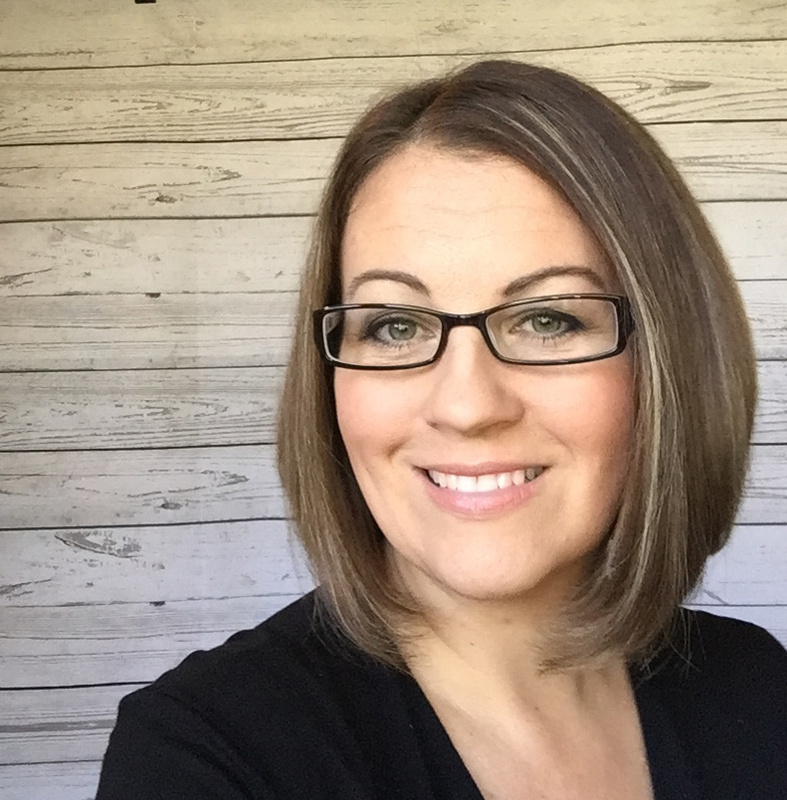 Thanks for sharing your beautiful ideas!!! Love that this idea works for multiple occasions. So pretty. Great idea for no candy Halloween treats. I can't wait to see what else I can fit inside those lip balm pouches. I can't waif for mine to arrive. I see lots of use for them. Wonderful and creative idea that can be used on several occasions! Beautifully done! Really cute! Love the Christmas ones for stocking stuffers. So cute! I love how these products make it possible to feature any holiday or celebration! The halloween ones are adorable! These are just fabulous! Love how you decorated each of these tags. I love these balm sets and tags. The Halloween interpretation is really cute! I love these lip balms so much ! They are the perfect little treat. Come December... you'll have Secret Santa and stocking fillers sorted! Love the Halloween tags! I would love to give them out if I lived in a neighborhood with few trick-or-treaters. Unfortunately, I get close to 300 every year. Will make great gifts for family and friends. Great ideas for that Lip balm die. Wonderful inspiration! love your cute little lip balm tags!! So cute! Love that you created a fun Halloween set too! Love the tags. the lip balm holder is one of my fave ever. Awesome tags!!! I love both versions!!! Absolutely cute and fun gift tags! (I love that halloween stamp set....). Great project! Such cute tags. Love the Halloween ones. Love these tag/gift ideas! TFS! I love everything about this post! Great tags!!! Love the fact that you could change the look of each with the change in the critters. Love the bitty bears a lot though. An awesome idea!! These are perfect for my club treats at Christmas! Thanks for sharing. These are so awesome! I feel like such a doofus since I never considered using these lip balm supplies for Halloween - just Christmas and Valentine's Day - but this is perfect for kids who are diabetic, allergic to peanuts or other things, etc. (Kids in our neighborhood actually prefer mini playdohs to anything else, LOL!) Thanks for the cool idea! I love how you incorporated Bitty Bears and Fab-boo-lous images on the tags too! BRAVO! Love these for simple sweet gifts over the holidays. I just can't get enough of these lip balm tags. I wasn't surprised to see they were already sold out. Great for gift giving and I love that you can give them away during any occasion. These tags are so cute! They are absolutely perfect for a little Halloween or Christmas gift. 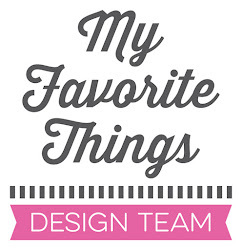 I love your designs on all four of them. They look wonderful! So cute and a great idea for Halloween! What a fun hop as my wish list keeps growing! No surprise the lip balm pouches are a sell-out because your favors are adorable. They could be used Year-round for sure. TFS, Julie! Oh so cute! Such a great little gift. These are so cute! MFT rocked it with the lip balm pouches. Adorable!!! Love both your Halloween and Christmas themed tags you made! Those lip balm gifts are a terrific gift that is beautifully colored. They would make a wonderful gift to teammates students, even boys and would like them if they are made in more 'manly' colors and papers. Love this! Such cute tags/gifts! Great release!